It doesn’t take long for most people who know me to figure out that I’m an introvert. I’m far more comfortable in groups of two or three than in groups of ten or twelve. I tend to hang back, listen, and observe in large social gatherings, or I find one or two conversation partners and stick close to them. And that’s if I make myself go! In general, I’d rather be sitting at home with a book. I’ve come to accept and embrace my introversion, but there are times when I think certain aspects of life would be easier if I were more extroverted and outgoing. What introvert hasn’t? In Quiet, Susan Cain discusses introversion and some of the reasons many introverts feel out of step in U.S. society today. In a nutshell, the U.S. has in the last century shifted from what Cain calls a culture of character to a culture of personality. Being stalwart and dedicated has become less valued than being magnetic and effusive. Those with the winning personalities are more likely to advance in the workplace, while those who are equally capable—perhaps even more capable—are shut out of leadership. She discusses how this tendency plays out not just at work, but also in schools, churches, and personal relationships. And she explains how in leaving introverts out of leadership, society loses many valuable qualities—such as caution and persistence—that introverts tend to share. In describing introversion, Cain discusses a variety of studies that show how introversion tends to coexist with other characteristics, such as high sensitivity, as psychological researcher Dr. Elaine Aron has explained. Cain explains the science behind these studies in clear and accessible terms and with plenty of examples to show how these scientific discoveries might play out in life. She also explores the physiological differences between introverts and extroverts and how much influence our genetic make-up, environment, and free will might have over our introversion. Most readers will probably, like me, constantly compare themselves with Cain’s descriptions of common qualities of introverts. I could absolutely see myself in her descriptions of highly reactive, highly sensitive, and non-reward-seeking individuals, although I could also recall plenty of times and situations when my actions and feelings did not fit those descriptions. Cain points out that not all introverts share all of these characteristics, and many extroverts might share some of them. In addition, an introvert, who is more likely to be highly reactive to stimuli than an extrovert, might be more reactive to some stimuli than to others. So one person might be highly sensitive to noise, while another might react strongly to coffee. This is a key fact for readers of this book to keep in mind because I think it would be all too easy to come away from this book with the idea that all introverts are fragile, frightened, and highly sensitive people, when the extent to which we have those qualities, and the situations in which they will manifest themselves, vary a great deal. Cain acknowledges this, often, but because her examples tend to show introverts demonstrating these qualities or learning to surmount them, it’s easy to forget that not all of us share the same fears, such as a fear of public speaking. As it happens, I enjoy public speaking as long as I have time to prepare and know what I’m talking about. (That desire for preparation is a typical introvert quality.) It’s not a fear I have to surmount—I’m not afraid of it and never have been. Parties, on the other hand, terrify me! Cain does describe a college professor who is a wonderful and comfortable public speaker who goes to hide in the restroom after speaking so he won’t have to go to a social lunch with the bigwigs who invited him to speak. I got the impression, however, that Cain saw the fact of his ease and apparent comfort at public speaking to be an oddity, when to me it seemed perfectly natural. I also found the distinction between shyness and introversion to be difficult to sort out. Cain notes that there’s a difference, but I didn’t think her explanation was clear or particularly convincing. The main difference as she explains it seems to be that shyness stems from a fear of rejection or of doing something wrong, whereas introversion does not. I know I’m an introvert, and I could fairly be described as shy in some situations, but I don’t think my shyness is necessarily about fear of rejection or of error. Often, it’s simply a matter of not knowing what to say in social situations and not having the energy to figure it out. The truth is, it’s hard for me to work out where my shyness ends and my introversion begins, but it’s something I’d like to understand. Besides describing introversion itself, Cain also explores when and how introverts might shed their introversion temporarily and whether it’s better to embrace our cautious natures or to step out and take big risks more typical of extroverts. Her discussion here seemed really smart and practical. Mostly, it boiled down to the idea that when we’re passionate about something, we’ll be more naturally inclined to step outside our comfort zone and that it can be valuable to do so, even if we have to “fake” a little extroversion. But we shouldn’t allow ourselves to believe that extroversion is superior. Both temperaments are valuable, even essential. In fact, introverts can often make use of their best qualities to succeed in negotiations and social situations without ever pretending to be something they aren’t. 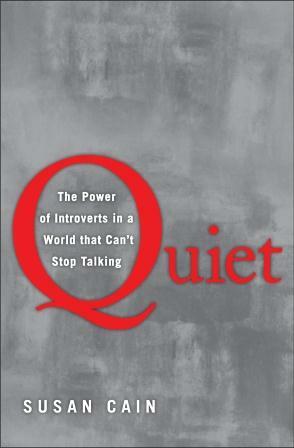 Other chapters discuss introversion and extroversion in different cultures, parenting and educating introverted children, and marriages between introverts and extroverts. There was a lot of information here and many more things I could comment on. Many of you will probably be interested to read about the value of online collaboration and sharing for introverts. And then there’s the introvert’s approach to friendship, hunger for deep conversation, and impatience with small talk, except in already established close relationships where small talk is embraced and valued. So interesting, and certainly true for me. I wanted to stand up and cheer when she talked about how there are different ways of being successful. So, so true, and so important to remember society pushes a particular idea of success . As you can see, there’s a lot in this book to talk about. Some of you might be wondering how this compares to The Introvert Advantage by Marti Olsen Laney, which got a lot of attention several years ago. I thought Quiet was far and away the better book. For one thing, it goes into more depth and explores introversion from more angles. Laney’s book was too basic and obvious; plus it skewed too far in the direction of telling introverts how to make themselves more extroverted so they can succeed. Cain offers a few ideas in that direction, but she also suggests that society itself needs to rethink its values when determining who has leadership potential and what qualities we value. I prefer Cain’s approach. Great review, Teresa! 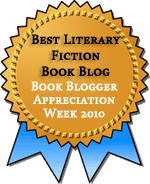 I just read another review of this year and added it to my tbr list. I think the author is right when you wrote that the current society in the United States is more focused on personality than character. That’s exactly it. I’m looking forward to reading this. Thanks, Vasilly! She gives a lot of examples showing that shift, and she’s pretty persuasive, although there are certainly exceptions. Last week’s Time Magazine featured article was on this subject and referred to this book. I suspect many of us in the bookblog world will find this book sympathetic and applicable to our lives. I’m one of those introverts who comes across as boisterous and gregarious at times but who MUCH prefers to be alone and quiet. The “spectrum” of introversion is certainly interesting. The spectrum is interesting, isn’t it? I can be quite a loud-mouth when I’m with just a few close friends or when I’m in a small discussion group talking about something that interests me. Wonderful review….hmmmm….I wonder just what the author ha to say about marriages between introverts and extroverts. Does she mention the arguments over whether we’ll out to that party or club or whatever OR stay cozy at home? I can’t be alone in that. She does mention that! In fact, the chapter includes a case study of a couple in which the husband wanted to *host* a party every Friday and the wife wanted no parties at all (and some less extreme examples). She talks about recognizing the importance of each other’s needs and finding compromises that address both people’s needs. The couple in question agreed that they would have two parties each month, but that the wife would stay on the fringes in one-on-one conversations while the husband took center stage. And then there’s the introvert’s approach to friendship, hunger for deep conversation, and impatience with small talk, except in already established close relationships where small talk is embraced and valued. Definitely, definitely relate to that. As well as your thoughts on being fine with public speaking but hating parties. For me, small talk at parties is the worst because of the lack of structure. With public speaking (or playing in a band, which I did for a while) it’s not nearly as bad because there is some structure to my expectations. I don’t have to drift vaguely among groups of people I don’t know. Yes! It’s all about structure. When speaking in public, I have a topic, often a podium, and some sense of authority and expertise. And performing in a play, which I *love* to do, is even better, because I have a script. At a party, I never know who might talk to me or what I’ll be expected to talk about (or feign interest in). It’s miserable. And just to be clear, Cain acknowledges the variety among introverts, but I’m not sure she illustrates it as well as she could have. She focuses on the constellation of qualities introverts are most likely to have, with few illustrations of introverts who fall outside those patterns. But the acknowledgement is valuable. I’m sick of hearing people say that introverts need to be more assertive in getting their voices heard and should always take the chance to say something in a meeting or in a public forum. it’s overrated. I have seen a great many introverts who are good productive, valuable employees, and the extrovert tends to do more talking and do less. In a sweeping statement of course, but evidence seems to support the claim. I agree that sometimes introverts get a lot done and don’t get noticed for it. I’ve had jobs where being able to chat people up seems more important than consistently producing quality work. It’s a shame, and we shouldn’t have to change our very natures to get appreciated for good work. Cain has a lot to say about telling people they *must* be more assertive. Her feeling is that a lot of the time introverts will be assertive when they feel it’s necessary, or they’ll be assertive in a quiet and sometimes more productive way (like Rosa Parks). Faking extroversion can be useful, but it’s not always the right approach. Loved this book! I’m glad it’s getting so much attention. I’m glad to see that, too. It’s sparking some important conversations. Wonderful review. The more I hear about this, the more fascinating I find it! I’m particularly eager to see what she has to say on the difference between introversion and shyness (especially since you’re not impressed by it) because I’m so often frustrated by how people assume those are the same thing. But I do wonder if I might not find myself frustarted when I do read this because of the narrow set of characteristics Cain uses to define introverts. I consider myself an introvert since I internalise most of my decision-making, am perfectly happy with my own company, and generally prefer meaningful conversations with a few close friends to pointless small talk with masses of people. But then she describes typical introverts as being “highly reactive, highly sensitive, and non-reward-seeking individuals” and I am none of those things! I really can’t wait to read this and find out what I think of it! I did find this post at Cain’s blog that delves specifically into the differences between introversion and shyness, and it is helpful. It seems that how much the two intersect is a matter for debate, and I know in my case, the one tendency affects the other. The fact that I get so worn out by social interactions (introversion) make it difficult for me to maintain the energy needed to know what to do (which makes me feel shy). Interestingly, I never would have described myself as highly sensitive or reactive before reading this book, but Cain’s explanations of these traits are a little different from what I would assume just hearing the words. And those aren’t the only qualities she talks about, just ones that show up the most in her discussion and examples. She mentions many times that they aren’t part of all introverts’ make-up, but it was easy to lose sight of that in the discussion. When I first saw this book advertised, I was intrigued by it. I think part of the problem with society (and it’s an endless one) is that there are always some qualities that are hyped and encouraged and others considered bad or worthless.Given that we are animals essentially with the programmed impulse to fight for survival, I suppose it’s inevitable that the loud, showy, go-getting qualities garner the praise. But every quality can be used for good or bad, and of course the way we need to act is dependent on the situation itself. It’s counterproductive to require everyone to behave according to the one pattern, although I doubt that will stop happening. The fascinating thing about identity is how complicated it all is, how responsive we are, how much dissembling we have learned to do, and how our characters can be highly influenced by wild events in our experiences. That makes it very hard for any theorist to lay down a pattern of characteristics that will make perfect sense to every reader who identifies with the category. I figure a book is doing pretty well if my own characteristics fit with 70% of what’s written. I’d quite like to look this one out, so hope it makes it to the UK! Oh and finally, I wonder how long it will be before someone writes a study of identity in the virtual world. Where the shy people go to be shy no longer. I’m pretty sure this is coming out in the UK, maybe in the spring, and I think you’d find it really interesting, Litlove. In fact, I thought of you when I read it because her discussion of highly sensitive people reminded me of your post on that topic. The evolutionary angle is interesting because Cain talks about situations in which introversion can have an evolutionary advantage. (Animals keeping out of sight of predators.) Cain talks a bit about why introverts thrive in online environments, and I’ve read an article or two that discusses it. For me, the asynchronous nature of online communication is great because I have time to rehearse my thoughts. And many introverts express themselves better in writing than in speaking, and online communication is writing dependent, so it really plays to our strengths. I’d be interested in differences between introverts’ and extroverts’ use of the Internet. I differ from you here, since I am absolutely terrified of public speaking, specially if I might have to face any member of my audience later. I am also scared of performing in any way in front of strangers. But parties dont scare me so much, since I can just hang about with people I know, and even I talk, its generally with one or two people at a time. I am looking forward to getting this book when it comes here to India. A very good review. I do OK at parties if I have a friend I can cling to, but I hardly ever enjoy them. I think I need a purpose other than mingling and chatting to enjoy myself. This sounds really great and definitely like something I’d enjoy. Public speaking was a HUGE thing I had to work really hard to overcome, and I’m still not quite there. It’s funny how I’m always super nervous with parties or meeting new people and don’t k now what to say – except when meeting bloggers because I feel like I kind of know blogging friends already so I can skip right to that being comfortable with small talk phase you talked about! Meeting blogging friends is so much easier than meeting strangers. At BEA, I was talking with someone (Florinda maybe?) about that. We get to skip over that whole phase of figuring out what we have in common, which is often so difficult. I do have extrovert moments though… when I know the people I’m with well, and bizarrely, when I’m speaking in public like being a quizmaster – when I don’t have to know the people I’m talking to. But also when I’m sure about my subject – I used to give technical training courses to customers, and presentations to the board at my old company, and having all the facts gave me the confidence I needed – but come the coffee break, back to being a shy little mouse! Social situations with strangers, or even people who are just acquaintances, can be awful for me. I much prefer to get to know people by working on a project together or having a discussion on a specific topic. And I know exactly what you mean about being comfortable speaking and then paralyzed at the coffee break. I just added this book to my wishlist because it sounds so interesting. I think I would prefer Cain’s approach of society needing to rethink some of its ideals to a book that propagates changing introvertism (probably not a word) into being more extrovert, Although it is probably true that in order to “succeed” in today’s shared definition of success it may be the faster approach, I find it hard to come to terms with it, exactly because, as you say, there are different forms of success. is a line in your review that I completely identified with. Thank you for your post, or I might not have found out about a book that I think will be very worthwhile to me. Thank you, Iris. I hope you find the book helpful. I really liked Cain’s philosophy of learning to make the most of our strengths, rather than reshaping ourselves to fit others’ expectations. I do think there are times when it can be helpful to act a little extroverted, but any definition of success that would require keeping it up all the time wouldn’t work for me. I still not overcome my fear of talking in front of many people. Thanks for this great review, Teresea. I added this title to my library hold list a couple of weeks ago and my curiosity about it is driving me nuts. I tend to agree with JoV, and am tired of the pressure to “be more assertive”. Two of my favorite books on this subject are “Solitude, A Return to Self” by Anthony Storr and “Party of One” by Anneli S. Rufus. Have you read either of them? I haven’t read Solitude, but I did read Party of One and liked it. I think Quiet is a lot more scientific in approach, but I don’t really remember Party of One all that well. Fabulous review. I’ve been seeing a lot of this book, and now I want to read it! Thanks, Jill. I love that it’s getting so much attention. Great review. Now I’m really looking forward to reading this book. So glad this turned out to be a good book. I put myself on the library’s hold list when I heard about it a few weeks ago. I’m number 40 or something like that out of a growing list. Must be lots of intoverts in Minneapolis! Not only are the a lot of introverts, but a lot of them like to read :) Hope you can get it soon! Very interesting! I’m especially curious to know more about leadership and introversion. Do introvert want leadership or do they look for personal/professional fulfillment in other ways? I’m wondering because most of us associate (good) leadership with charisma and a knack for effortless networking. I guess I would call myself an extroverted. I’m the one who usually gets the conversation going among groups of strangers at parties. It’s hard-work and extremely energy-consuming (especially during work functions). During those occasions, when the crowed is particularly though, I can’t help but envy the introverts, who “hang back, listen, and observe” (and usually don’t make my job any easier :P). My boyfriend thinks I’m strange because I always take on the responsibility to be the social-smoother and he’s right, there is something strangely compulsive about it. I’m guessing that the desire for leadership depends on the particular introvert. I don’t mind taking on certain kinds of leadership roles, but there are others I’d avoid like the plague. She does talk about how introverts often do well as leaders if they’re leading a group that tends to have lots of ideas and energy because the introvert can be good at hearing all the ideas and pointing them in a productive direction. I’m really interested in what you say about the compulsion to get conversation going. I appreciate people who have the gift for doing that, but I can see how it would be hard when the whole crowd is acting cold. That’s just awkward for everyone, including the introverts. I am an introvert and I fret quite a lot about what manifestations of my disinclination to go out and do social things are regular introversion (which is okay), and what ones are because I’m anxious (which I should try to combat). It’s always nice to have a good, validating read about what introverts are like. I worry about the exact same thing. Or I wonder whether I want to stay in because I’m a misanthrope who needs to learn to like people more or because I just need alone time to recharge. Very nice write-up. I’m eager to read this myself. I think the distinction between being shy and being introverted is very important too. And it sounds like she has some interesting ideas about introverts that I’d disagree with (I need to read it to find out what I think of her thoughts). But also, it’s important to realize that there are different degrees of being an introvert. I always considered myself an introvert. I too dislike parties and large groups. The thought of entertaining more than one small family is completely overwhelming: we seldom even have on family over to dinner simply because I get so panicked and find it so difficult. But my husband is also an introvert, and I consider he is the more introverted, although he has no problem with public speaking (he went to college on a debate scholarship) and is a successful manager when necessary at work. He considers introvert to be in the home moments: the fact that he can’t stand small talk (even with me — only talk if you have something to say!) and the fact that I really do tend to talk without thinking it through because I LIKE talking to people I know. In public scenarios, though, I need to prepare what to speak, I hold back when I don’t know people well, and I don’t like to approach strangers. I see the difference between us as introvert (my husband) and more shy (myself). But as you emphasize, it does make a difference if I know people. I do like to recharge by myself, but it’s not quite the same as my introverted husband who NEEDS it. There were definitely plenty of things she said that aren’t true of me, and most of the time she was clear that not all introverts are the same, so it didn’t bother me too much. And you’re absolutely right about degrees of introversion. When it comes to needing alone time, I’ve gotten more introverted as I’ve gotten older. I really cannot cope if I don’t get two nights at home each week, and I used to be fine with just one. Pleasing post, and now I want to read this book! The question of introversion vs. shyness is an interesting one – I definitely was considered “shy” as a child, and I think all of my report cards from 1st grade on talked about how it’d be nice if I would just contribute to class discussions more. But as an adult I feel like it’s much more introversion. Like, it’s not that I have something to say but feel scared to say it, it’s that I need time and quiet to formulate my thoughts, preferably in writing rather than aloud, before I can figure out what it is that I want to say. Though I guess there is some overlap – feeling the need to have my thoughts formulated before I share them may, in a way, be about not wanting to be judged based on my half-formed/off-the-cuff thoughts. Lots to think about, and I’m enjoying reading the comments on this post. I like the way you make that distinction. It’s the same for me, which means I often don’t speak up in meetings because I want to think everything through. But if I force myself to speak, I’ll often end up all tongue-tied because I haven’t finished thinking. And that makes me shy about it. Sigh.